High efficiency, modular power converter. 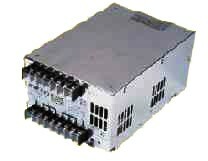 These DC-DC converters have high DC input voltage (90 to 370 VDC), and have a wide range of output voltages available. These are NOT suitable for charging batteries, for high voltage DC converters capable of charging batteries look here.